In a previous blog entry I discussed some of the exotic properties of graphene. The fact that graphene consists of a single layer of atoms means the aspect ratio of any graphene-based structure may be very high. 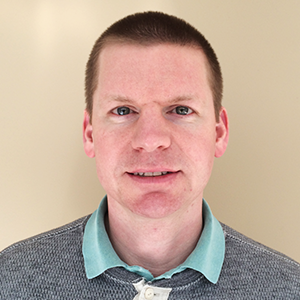 High aspect geometries present their own array of modeling challenges. COMSOL provides a wide range of tools to assist in modeling geometries and features with very high aspect ratios. Thermal modeling of graphene quilts was recently performed in COMSOL and appeared in Nature Communications: “Graphene quilts for thermal management of high-power GaN transistors“. The authors of the paper use COMSOL Multiphysics to show that the local thermal management of a AlGaN/GaN heterojunction field effect transistor (HFET) can be substantially improved via introduction of the additional heat-escaping channels — top-surface heat spreaders — made of few-layer graphene (FLG). 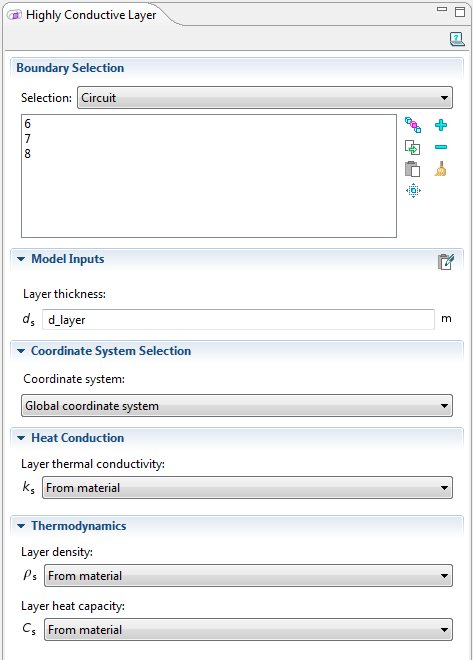 The Heat Transfer interface in COMSOL Multiphysics allows you to model very high aspect ratio components using the Highly Conductive Layer feature. This feature solves the heat transfer equation only in the tangential plane of the surface, thus removing the need to use a very fine mesh on the high aspect ratio layers. Computation time and memory usage is substantially reduced using this approach. The settings window for the Highly Conductive Layer feature. COMSOL has been used to study the electrical characteristics of graphene from as far back as 2006. In this paper researchers used COMSOL to infer the in-plane and transverse electrical conductivity of a graphene-based composite material. 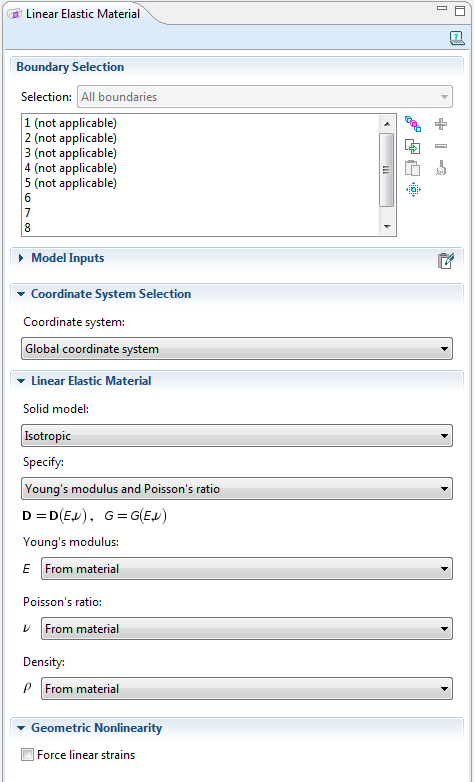 Providing tensor quantities for electrical conductivity is very easy in COMSOL Multiphysics. You simply need to provide the elements of the conductivity tensor, which can be functions of temperature or any other quantity. 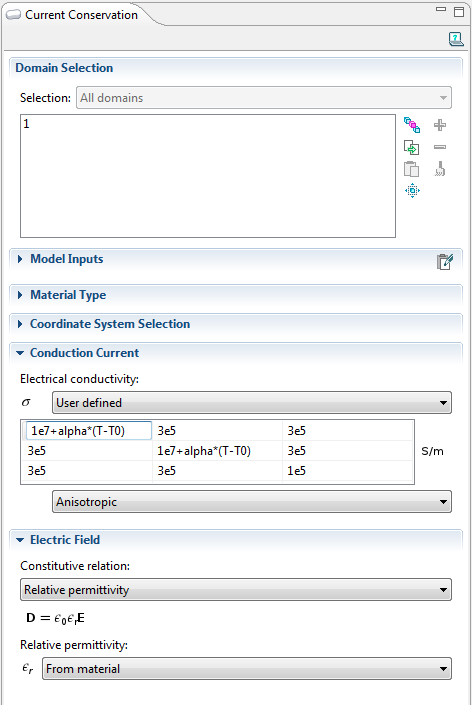 In the settings windows for the Current Conservation feature in the Electric Currents interface, it is easy to specify anisotropic electrical conductivity. COMSOL may also be used to model structural applications of graphene. In this paper researchers calculated the deflection and strain induced in a graphene membrane subjected to a pressure difference. Changes in the band structure could be detected electrically, suggesting a potential application as ultra-sensitive pressure sensor. The Shell interface, available in the Structural Mechanics Module, is intended for the structural analysis of thin-walled structures and thus perfect for such applications. The formulation used in the Shell interface is a Mindlin-Reissner type, which means that transverse shear deformations are accounted for. This means that highly accurate results can be obtained without the need to mesh a very thin structure. Settings window for the material model in the Shell interface. Now that we’ve gone through thermal, electrical, and structural modeling concepts you might wonder if there is one grand example that demonstrates all of the concepts at once. There is — it’s located in the Model Library and shown below as well. Model of a heating circuit demonstrating thermal, electrical, and structural modeling concepts. 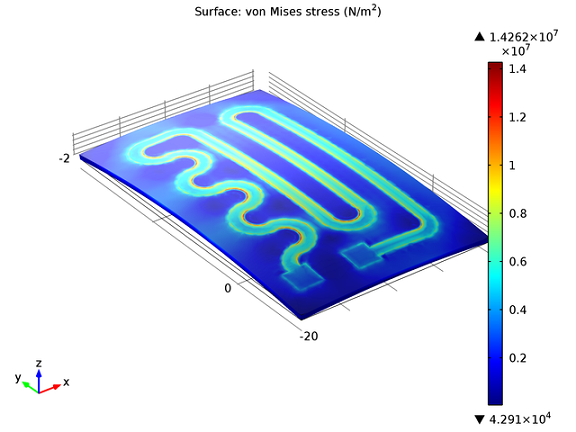 This multiphysics example simulates the electrical heat generation, heat transfer, and mechanical stresses and deformations of a heating circuit device. The model uses the Heat Transfer interface of the Heat Transfer Module in combination with the Shell and Conductive Media DC interfaces from the AC/DC Module, and the Solid, Stress-Strain, and Shell interfaces from the Structural Mechanics Module.